Twenty-eight years ago this month, then-U.S. Secretary of Education William Bennett came to town for a closed-door meeting with Chicago United, a business coalition deeply involved in the push for reform of the Chicago Public Schools. In fact, Bennett’s comments were not much harsher than local critiques. The district had long been in trouble. Nearly a decade earlier, financial mismanagement in CPS had prompted the state Legislature to replace the entire Board of Education and create the Chicago School Finance Authority to manage district finances. Later, nonprofit watchdogs from Chicago United to Designs for Change and the Chicago Panel on Public School Policy issued harsh reports urging CPS to streamline operations and focus on reducing high numbers of dropouts and truants. See The School Project, “Chicago Schools – The Worst in the Nation?” October 2014. 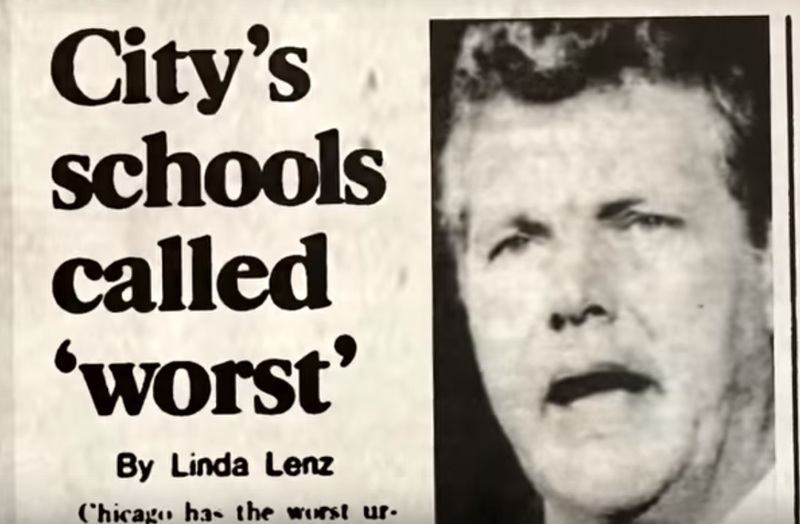 Bennett’s description of Chicago’s public schools had staying power. But a closer look suggests that schools and the district made “considerable unsung promise” over the ensuing years, according to Elaine Allensworth of the University of Chicago Consortium on Chicago School Research. Beginning with the early years of local school councils, many schools showed improvement in test scores—though it is hard to separate the effect of improving economic conditions in many communities from the effects councils had on their schools, Allensworth notes. For some schools, there’s no question reform brought significant, positive change. Take Spry Elementary in Little Village, where two teachers stepped up to serve on the new LSC and led the agonizing struggle to remove an ineffective but popular principal. His immediate successor, Carlos Azcoitia, reduced overcrowding, won grants and built strong partnerships with the surrounding community. Yet even here, the process of raising academic achievement looked more like a mountain climb than a rocket launch. Recently, WBEZ took a very long view of the question: “Were Chicago’s public schools ever good?” and concluded that now may be the closest we’ve yet seen to a golden age in CPS. Thanks to research by the Consortium, the city’s education community has had the benefit of guideposts like the 5 Essential supports for school improvement and the high school on-track (to graduate) rate. See “Considerable unsung promise,” Catalyst October 2015 and “Chaos to progress: one school’s turbulent tale,” Catalyst February 2000. Also, a short documentary from The School Project that captures Bennett’s 1987 remarks. Recent years have brought Chicago good news on student outcomes. Although CPS recently revised recent graduation rates downward due to faulty reporting by schools, the overall trend in graduation rates has been on a steady incline in recent decades. This year’s results on the National Assessment of Educational Progress put Chicago among the top urban districts for increases in 8th-grade math and 4th-grade reading. But scores were flat in 4th-grade math and 8th-grade reading, and achievement gaps between white students and students of color widened here more than in other districts. Meanwhile, Detroit still lags Chicago. Its NAEP scores, for example, ranked lowest among big cities for the fourth time since 2009. Detroit’s district-run schools have lost more than 100,000 students in the last decade. Many have gone to charters, but a Detroit Free Press investigation found that Michigan does a poor job holding charters accountable for student performance. In October, Michigan Gov. Rick Snyder proposed a controversial $700 million plan to reboot the district. While Chicago can no longer be said to have the worst school system in the nation, its current challenges—including turnover in superintendents and the worst budget crisis it has ever seen —still keep it down. Getting to greatness will require some stability and a sustained focus on the fundamentals of teaching and learning. See “Racial gaps wide as some elementary math, reading scores improve,” Catalyst October 2015 and “Well, since you asked,” Catalyst October 2015.